It’s true, most people suffer from mundanity in their everyday lives. Go to work, come home, eat dinner, go to bed. Going about your day running on autopilot. Sound familiar? What if there was a way to reach people simply by catching them off guard with a unique sign? 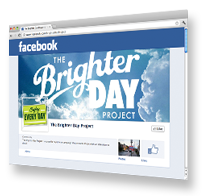 The Brighter Day Project was developed as a way to bring a bit of unexpected happiness to passersby. The signage is designed with very simple messages as reminders to “Enjoy Everyday”, that “You’re Awesome!”, or that “You’re doing a great job!”. Because everyone could use a little encouragement.